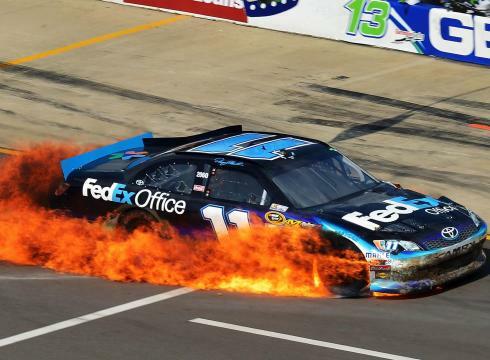 Denny Hamlin finished 34th in Sunday’s NASCAR Sprint Cup Series race at Michigan International Speedway, as he was forced to retire early following an on-track incident on Lap 132 (of 200) and subsequent fire under the #11 FedEx Office Toyota. The incident occurred on the first lap of a restart, when cars were four-wide into Turn 3 at the two-mile track in the Irish Hills. Hamlin was nudged from behind in the left-rear by another competitor, sending him spinning into the infield grass that caused left-side damage to his race car. As Hamlin drove to pit road for repairs, a fire erupted underneath the car, and he stopped before safely climbing out. Hamlin started 11th in the rain-delayed event won by Dale Earnhardt Jr., and ran in the top-15 in the early going. Pit strategy forced the team to make green flag pit stops earlier than others, and twice, the caution came out right after to put the #11 car a lap down. Hamlin used the wave around rule to get back on the lead lap, and battled back up to eighth when the Lap 132 incident occurred. The finish dropped Hamlin one spot to fifth in the NASCAR standings following Michigan, 51 points behind leader Matt Kenseth after 15 of 26 regular season races. The Series returns to action at the road course in Sonoma, Calif., on Sunday, June 24.